The environments we inhabit and the spaces we create for ourselves inform and shape us just as we go about shaping and decorating them. “Safe Spaces” is a new series meant to explore that relationship, by visiting female and female-identifying creators and doers in the spaces and places nearest and dearest to them. Follow Berkman Drive long enough, into the upper creases of North Austin, and you’ll find a nondescript shopping strip center. There, in its furthest corner, past the Beall’s and the Domino’s pizza, are the frosted windows and high ceilings of Cement Loop studios. 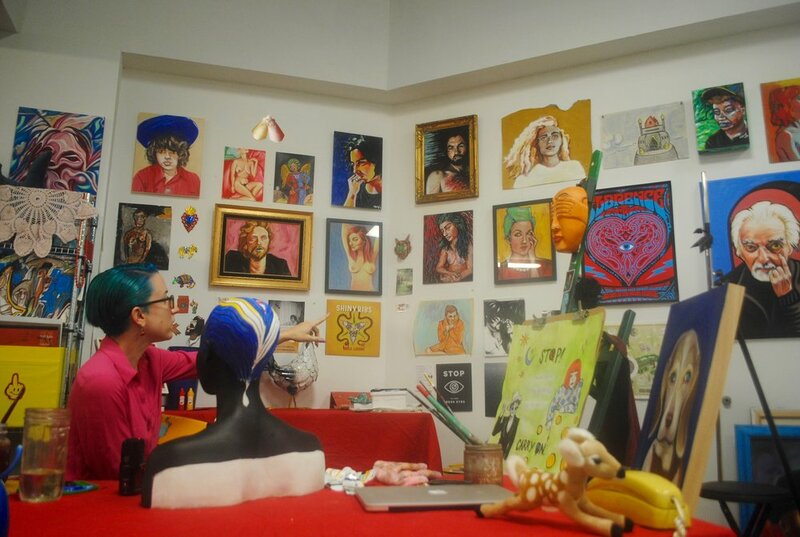 On any given night, visual artist Ashton Guy is likely inside, resplendent in color and cartoon energy, blaring music (if it’s late enough) and painting in the studio space she shares with fellow artists Kaitlin Merchant Davison and Christine Vanderkaap, as well as one-eyed Winky, Christine’s apparent sidekick. Among the displayed artifacts of what she calls “a tornado of my favorite people, colors, shapes, words, and sounds” are old family photos, artwork by @darbscrash666 and @artbyjet, Father John Misty records, a shark, a rooster, a deer, snakes, antlers, a Chinese wooden mask gifted by her dad, Dr. Seuss books, a map of Rushmore from the Criterion edition DVD, fake sheepskins, her own artwork, and a yellow telephone, gifted from a friend, that she often talks to herself out loud through. Guy came to set up shop here in December 2015, when she outgrew the desk in her dining room “studio.” Seeking to split the space (and the rent tbh), she made an announcement at a Boss Babes meet and found Merchant Davison. Vanderkaap soon joined. Guy believes creators can create anywhere (she has), but that having a designated creation space — a lab, as she calls it — is critical for channeling expression into a full-time gig. “As soon as we got the space that Christine, Kaitlin and I all share at Cement Loop, the way I saw myself as an artist changed,” says Guy. “My distractions are fewer and focus is at an all time high, my work ethic was completely revitalized, I have more workspace, more natural light, other folks to turn to as sounding boards, I feel more understood." Those other folks include Vanderkaap and Merchant Davison, who occupy the other corners of the Cement Loop space. Despite different working schedules and styles, the three have formed their own community, a little family in which Vanderkaap handles the snacks and Merchant Davison helps with the business side of things. The three have even discussed collaborating on a project at some point. And somehow, the clash of color and pattern and texture and medium does work to become a cohesive space that so viscerally evokes the energy of one Ashton Guy.